Japan is a land full of surprises and variety due to its proximity to the tropics, and conversely the boreal zones of the Asian mainland. Habitats are variable as well, largely due to the mountainous nature of this long island chain. In one region alone you can travel from cool temperate rain forest to subtropical lowland hills and islands. In this video series you get the chance to see Japan’s many faces – the flowering plants, ferns, trees, shrubs, and even animals season by season. What you will find may surprise you. I know it did for me the first time I stepped into its forests, mountains, and hidden valleys. So, enjoy this seasonal tour. Spring Scenes part I – Spring in southern Japan starts sometime in mid-March with a rush of flowering plants and general growth. Temperatures remain on the cool side most days and nights can very downright cold. By the first week of April the iconic cherry blossoms of this nation are in full swing, as are seemingly countless other species of flowering plants, ferns, and even mosses. Watch the parade of early spring in this video and be amazed. Spring Scenes part II – The spring series continues in this epic episode. By mid spring wildflowers are peaking and plant growth in general is rampant in southern Japan. You can see a wide array of flowering plants, including wildflowers, orchids, vines, and trees and shrubs, as well as many ferns in full spring growth. 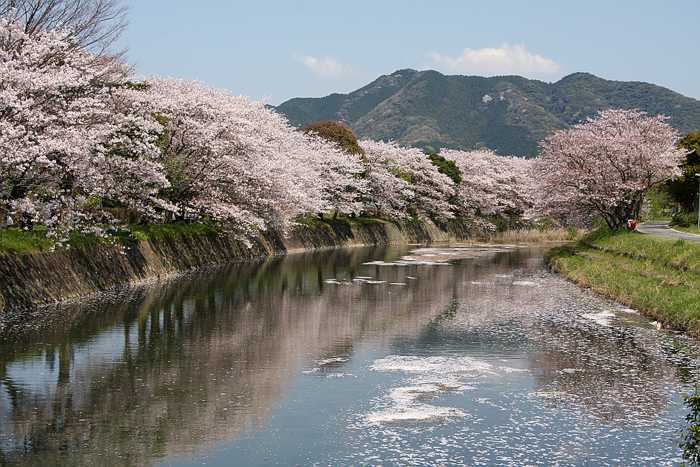 This video captures the essence of spring in southern Japan from the finishing of the cherry blossom season in mid April up to late May, just before the monsoon rains of June soak the landscape. Monsoon Season Scenes – June marks the beginning of the summer monsoon season – a period of seemingly continuous rains. This is a time when a number of flowering plants are at their best, and interestingly several fruits become ripe, notably Japanese plums, hence the Japanese name for this season: the plum rains. Rivers rage, ferns flourish, and myriad insects grow in number and size, creating their signature choral din by this season’s end. In this video you’ll see many common and rare plants, including 11 species of orchid, one of which is critically endangered, Odontochilus hatusimanus. The season ends in mid July with the Yamakasa Festival in Fukuoka City. Surly the largest commonly grown ornamental palm in the world is the Canary Island date palm, Phoenix canariensis. A close relative of the true date palm, P. dactylifera, this species is much more widely grown due to its ability to live in a broad range of climates and soils. Beyond that, this palm is truly stunning as a mature tree. Phoenix canariensis is a massive palm with a single trunk growing typically up to 20 meters, but vigorous specimens have reached twice that height. The thick trunk is up to nearly a meter across with a wide, bulbous flaring base. It is prominently marked with petiole scars that have a stacked appearance, and is usually light brown in color. A mature specimen of the Canary Island date palm is truly an impressive tree. This one is growing on the island of Kyushu, Japan. 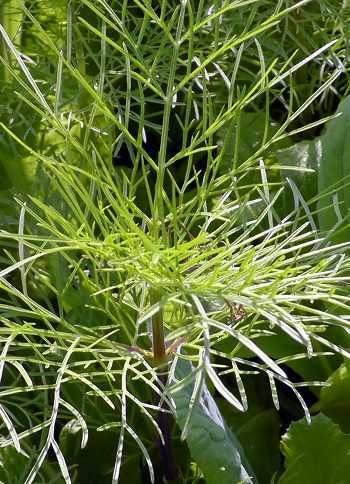 The fronds are pinnate, growing from 4 to 6 meters in length on mature trees. The individual leaflets (called pinnae) are simple and narrow, between 20-40 centimeters long each. The central shaft of the frond, the rachis, widens at its base and is armed with long, sharp spines. The overall appearance of the fronds is like a long feather. A mature specimen can hold a hundred or more fronds at one time, forming a dense, nearly rounded crown up to 10 or more meters across. Like other palms the petiole bases can persist for some time, an attribute particularly noticeable on pruned specimens. Flowering starts in early spring. The bright orange branched flower scapes are born abundantly, but remain tucked within the the crown even in at full maturity. These palms are dioecious, meaning male and female flowers are found on separate trees. Fruits are ripe by fall or early winter, and though fairly large, are not particularly fleshy, and so do not make a good date for eating. A single large seed is contained in each fruit. P. canariensis is an endemic of the Canary Islands, a volcanic island chain off the southwest coast of Morocco in the Atlantic Ocean, and though owned by Spain, are largely self governed. This palm is found throughout the main islands, however its distribution is scattered and localized due to centuries of human activity. The largest remaining populations are found on La Gomera. 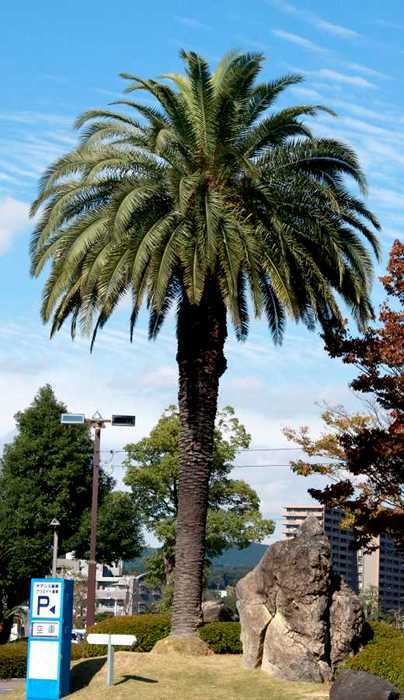 The introduction of exotic Phoenix species (especially P. dactylifera) has put the remaining populations at risk since these palms easily interbreed, creating hybrid trees that can be difficult to distinguish from wild ones. They can be found in a wide range of habitats, typically in dry subxeric Mediterranean areas and more rarely in wet cloud forests, known locally as laurisilva, consisting of broadleaf subtropical evergreen trees. In some areas P. canariensis is the dominant species, and these communities are known as palmerales. Nowadays these once natural associations are highly influenced by humans who have introduced exotic species or expanded them by planting more palms. This species grows from sea level to around 600 meters elevation in its native habitats. For more about this palm in its native habitat please read this fascinating article from the journal of the International Palm Society: Phoenix canariensis in the wild. 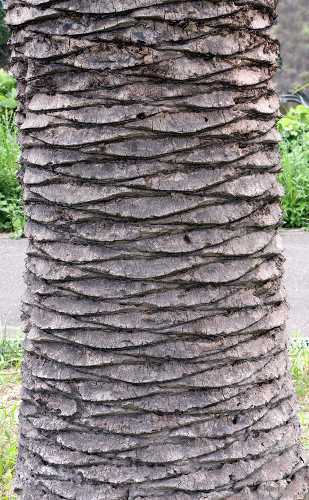 The trunk of the Canary Island date palm has prominent petiole scars “stacked” on top of each other. In of spite being from the relatively low elevations of subtropical islands, the Canary Island date palm is remarkably cold hardy. Most sources state large trees can take -10 C (14 F) for brief periods and rebound, though fronds are damaged at much higher temperatures, taking no more than a couple degrees of frost before die-back begins. Nevertheless, consistent reports of them surviving in USDA cold hardiness zone 8 persist, at least in areas where summers are hot. Having said that, as long as the average temperate remains a few degrees above freezing in winter, this species seems to hold on. Reports of specimens growing in cold weather latitudes also abound, for instance the warmest parts of the British Isles (including London), Tasmania, and even the coastal areas of British Columbia, Canada and along the coasts of Washington and Oregon in the US if given protection in winter. On the other hand, it is able to live in truly tropical places as well, making it one of the most temperature resistant palms in cultivation. Each fall the people of Japan and thousands of visitors to this country look forward to an annual event – the changing of maple leaves to the vibrant colors of autumn. Starting in the north around the last week of September and extending to as late as early December in Kyushu, various Japanese maple varieties put on a show of color that is rivaled only in a few places in the world. These large Japanese cedar trees (Cryptomeria japonica) and close clipped azaleas attest to the beauty of Raizan Sennyoji Temple and its grounds. Kyushu, despite its southern latitude, harbors some very nice fall leaf viewing from early November up to the first week of December. The best places to look for them are in the remaining natural forests at elevations above 400 meters, particularly along Kyushu’s central mountainous region. 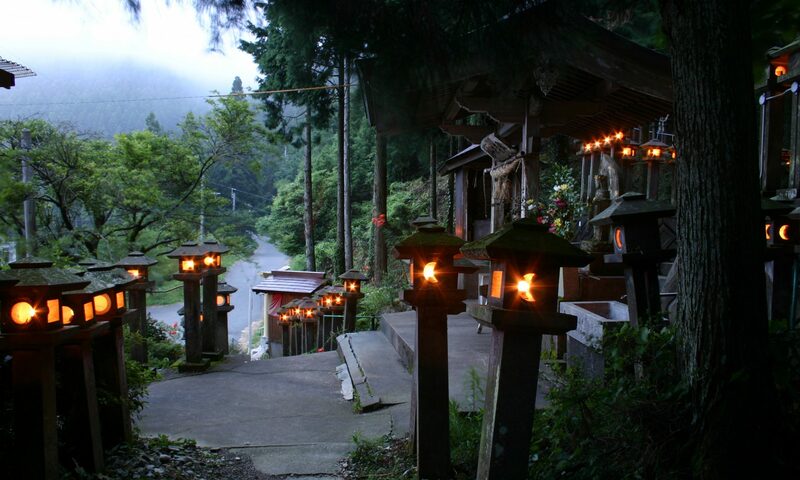 Another good option is to look for them at the thousands of shrines and temples that dot the landscape. Even the deepest urban centers are home to these holy places, and almost invariably you can see at least some fall color in the surrounding gardens and woods. In this pictorial essay the focus is on Raizan Sennyoji Daihioin Temple (hereafter referred to as Raizan Sennyoji) in Fukuoka Prefecture located just southwest of the Fukuoka City metropolitan area. Raizan itself is a 954.5 meter tall summit found along the main ridge line of the Sefuri Mountain group, straddling the border of Saga and Fukuoka Prefectures. The temple is found on its northern flank deep in a valley at around 340 meters elevation near the headwaters of the Raizan River. 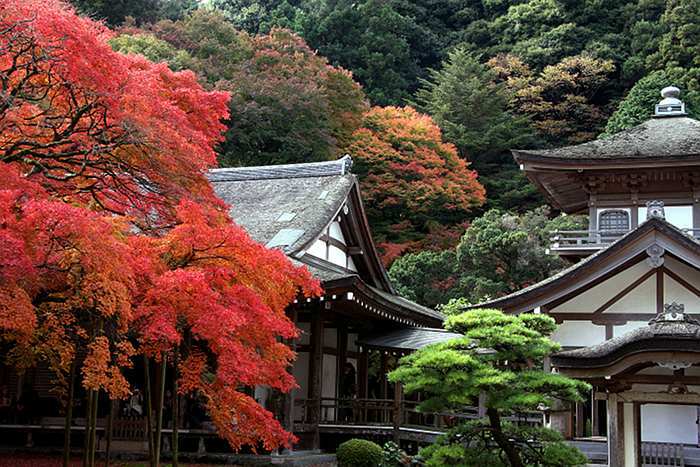 Among its dozen or so temple buildings is a lovely garden and woods that are home to many maple trees, the subject of this article. The immaculate temple buildings of Raizan Sennyoji are surrounded by beautiful natural and human planted forest. 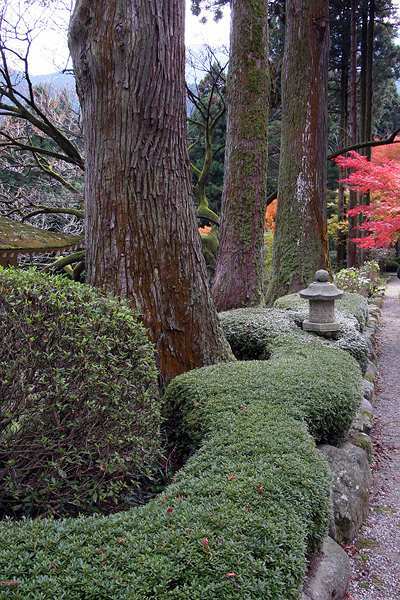 In this picture we can see native forest in the background, a dwarfed Japanese black pine in the foreground, and to the left, the garden's centerpiece - a 400 year old Japanese maple. 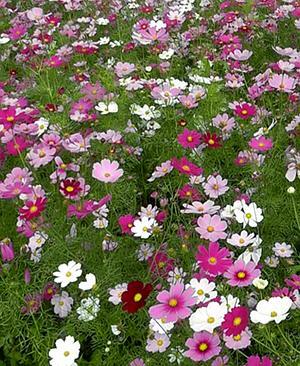 Hailing from the volcanic mountainous region of central Mexico, the common garden cosmos, Cosmos bipinnatus, is one of the most widespread annual flowers in the world, being found on all continents except Antarctica. From its humble origins it has been cultivated and bred for less than a hundred years and yet today the variety of flower forms available is truly staggering. Cosmos bipinnatus growing in full sun puts on an incredible show. This field is in Kyushu, Japan. Cosmos bipinnatus is a weedy annual herb found on disturbed fields and roadsides across the globe. Growing from 0.3 – 2.0 meters or more high, it tends to have a rambling habit, particularly as it grows taller. The complex pinnate leaves are composed of very narrow leaflets that are twice divided (bipinnate) and held in opposing pairs, giving them an airy, feather-like appearance. The flower heads are borne singly on long stems (peduncles) held well above the plant, are usually 5-7 centimeters across, but can be up to 10 centimeters in selected varieties. Flower heads are made up of two flower types – small centrally clustered disc flowers surrounded by a ring of ray flowers with lobed petals (corollas) up to 5 centimeters long. Disc flowers typically are bright yellow and the corollas of the ray flowers range from pure white thru various shades of pink and purple. The dark brown, elongated seed is produced in large quantity, enough to make this a potential weed in warmer climates. The name “bipinnatus’ means twice pinnate, a reference to the twice divided foliage of the species as seen in this young plant. The natural distribution of C. bipinnatus is somewhat obscure with most sources (including efloras) stating “Mexico and the southwestern U.S.”, though in all likelihood it is originally from central Mexico. Regardless, nowadays the species in both its cultivated and self seeding forms can be found all around the globe in open fields, roadsides, or any other human disturbed ground. North of the Mexican border it has been recorded in 36 states of the U.S. as well as two Canadian provinces, where apparently it is self-seeding, at least on some sites. It has also been recorded throughout all of Japan south of Hokkaido, where it is both self-reproducing and cultivated. So what is the attraction of this short lived herb? It’s irresistible, variably colored flowers of impeccable symmetry, are the obvious answer. It is said they were given the name “cosmos” by Spanish priests who grew them on mission grounds due to the perfect symmetry of the flowering heads (cosmos comes from the Greek word κόσμος, meaning the order of the universe, or the opposite of chaos). Since those early days of cultivation, breeders have taken this lowly annual herb and created an astounding range of flowers. Picotée – white petals with pink to red marginal bands. Sensation Series – large flowers, color varying from carmine through pure white. Average height, up to 2 meters. Sea Shells – tubular trumpet-like fluted petals in variable shades of pink. Sonata Series dwarf mix – Fleuroselect Awarded variety with large flowers on a relatively short plant (up to 60 cm). Like the Sensation Series, flower color is variable. Also given the Award of Merit by the Royal Horticultural Society. Candy Stripe – similar to Picotée with pink to red margins. Double Take – large, double to semi-double flowers up to 10 cm. Gloria – bi-color flowers with a dark pink to red center. Psyche Mix – Semi-double, frilly flowers from burgundy to white color. 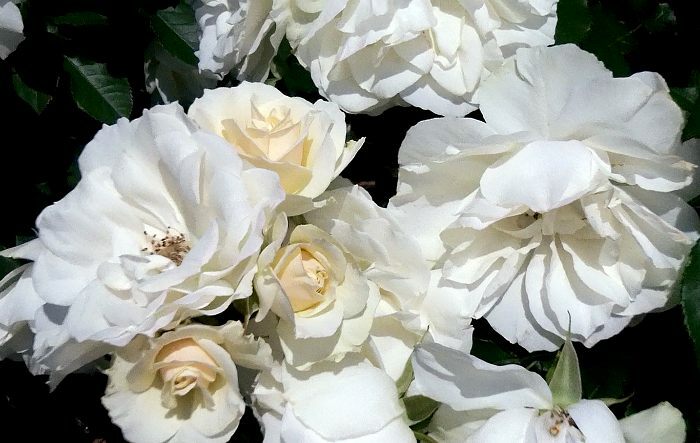 Purity – pure white flowered variety. 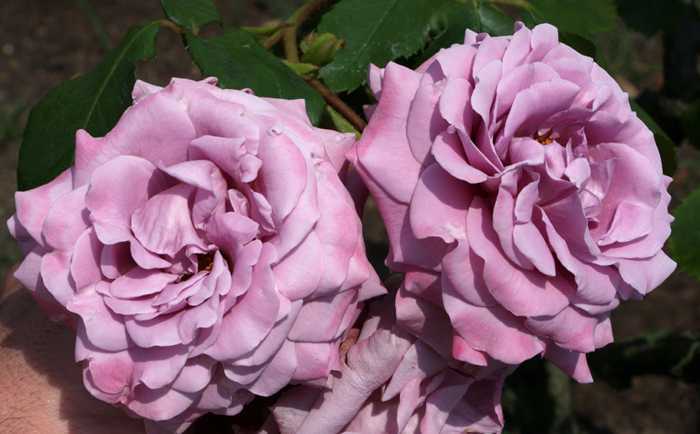 Pinkie – as the name suggests, a pink flowered variety. Radiance – flowers with a pink to red center, similar to Gloria. Dazzler – deep carmine red flowers with yellow centers up to 10 cm. Cupcakes – petals fused together, forming a bowl shape, white flowered fading to pink. 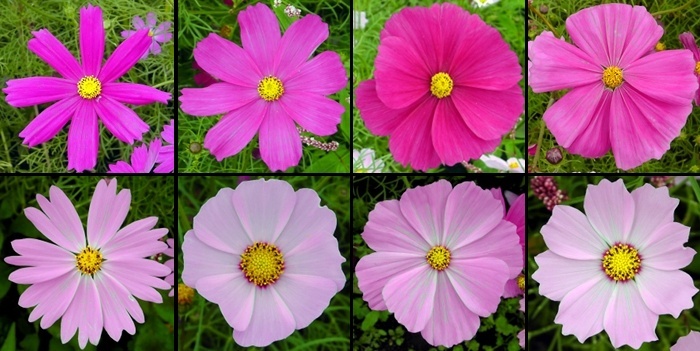 Garden cosmos commonly are some shade of pink to lavender. These flowers show a good mix of types, some having narrow petals, some with fused petals, deeply lobed petals, more rounded lobes, and so on. Here is the final installment covering the roses of Kayoichou Park in Fukuoka, Kyushu, Japan. This treatment is by no means comprehensive, rather just representative of the roses to be seen at the garden. To see other roses at the park, check these links: Part I and Part II of the many roses at Kayoichou Park. So, here is the final set of roses for you to feast your eyes on. Enjoy! Comments: A lovely, trailing rose great for training as a climber, etc. It has many large clusters of shocking crimson cupped flowers throughout the warm season. Best in USDA zone 6b and higher. 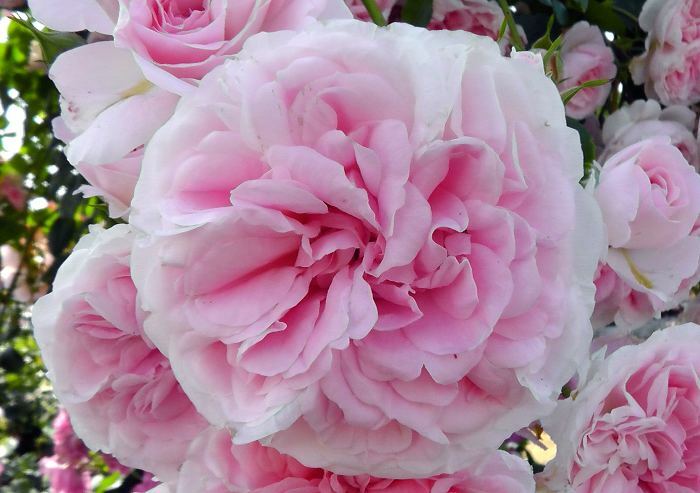 Comments: Here’s a neat, small flowered rose with clusters of old fashioned rosette blooms that flower continuously throughout the season. Said to be disease resistant and shade tolerant. It is both cold and heat tolerant as well, growing from USDA zones 5b-9b. 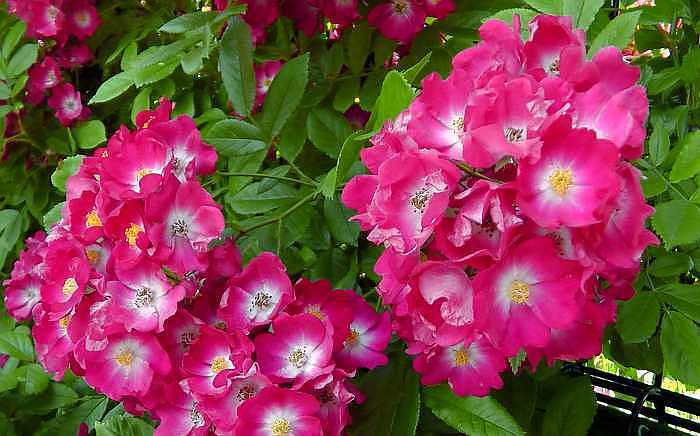 Comments: A beautiful continuously flowering rose with generous clusters of smaller blooms. Upright grower to 150 cm tall. Cold and heat tolerant, USDA zones 5b-9b. 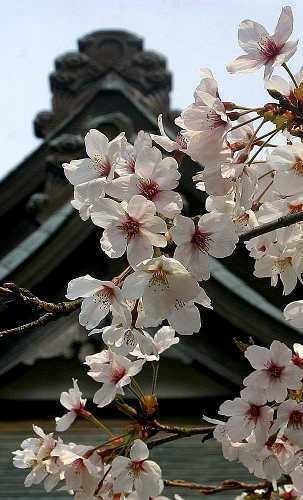 Perhaps the most widely planted of flowering cherry trees in Japan today is the Yoshino cherry, Prunus x yedoensis. Despite its popularity within Japan, and indeed around the world, this Japanese cherry blossom has a history that is relatively brief, and yet the specifics of its origins remain mysterious. Regardless, it is considered one of the most spectacular of flowering temperate trees in cultivation today largely due to its habit of simultaneously opening thosands of showy pink-white blossoms on bare branches – a sight to behold in person. The Yoshino cherry is a fast growing tree in the first 20 years of its life, then slows down a bit, ultimately reaching heights of 12 meters or a bit more (~40-45 feet), and nearly as much wide. The uniform crown has a spreading, rounded, inverted vase shape with fine branching. Young trees tend to grow upwards, but around 30-40 year old trees begin to spread, with older trees developing attractive hanging branches. The dark reddish-brown bark is marked by prominent lenticels (lens shaped pores in the bark that allow gas exchange). Trees are typically single trunked. 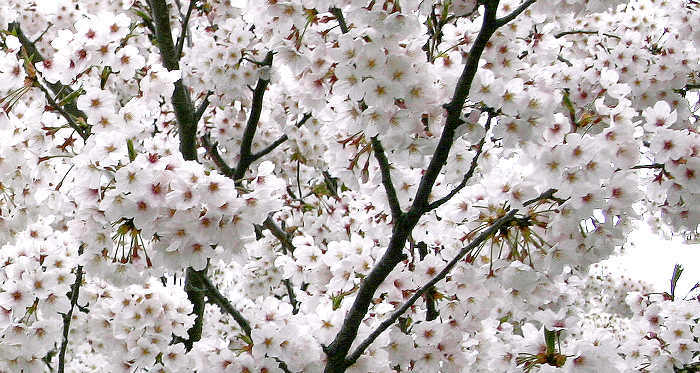 The Yoshino cherry has abundant pink-white blossoms from late March to mid April. The simple, broad leaves are borne alternately, are serrated, elliptic to ovate, and up to 15 centimeters long (6 inches). They flush directly after flowering has finished, remaining green until the fall when they turn yellow to orange or orange/red. Flower buds develop during the summer months, remaining dormant until warm days in late March or April trigger them to swell. Without a doubt this tree’s greatest feature are its lovely pale pink to white blossoms which are borne in generous clusters all along its bare branches. Occasionally they can occur here and there along the main branches as well. Each flower is from 3-3.5 centimeters in diameter, sporting 5 broad petals, first opening pale pink and fading to near white as they mature. These occur in clusters of 5-6, and flower nearly simultaneously on any given tree. The round fruits (known as drupes) quickly ripen, starting out green, then turning red, and finally mature black. They are small (around a centimeter wide), mildly sweet, and not very tasty due to their high acidity (I know, I’ve tried them). Fruit formation is usually fairly modest in this tree. Being of hybrid origin, Prunus x yedoensis is not found in nature – at least not these days. A little back story first: when botanists started to look at Japanese cherry varieties in a systematic scientific manner, they immediately found themselves in a complex quagmire. Trees that were thought to be species seemed to be possible hybrids, accepted species had different forms (for example upright and weeping), and differences between trees could be very subtle. 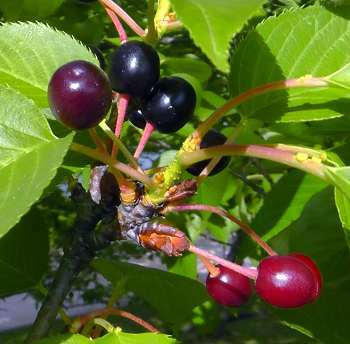 Add to this mix the fact that Japanese horticulturalists had been selecting and hybridizing cherries for centuries long before the concept of a species (in the western tradition) was even recognized, and you’ve got a mess on your hands. And out of this situation arose the question – what is the Yoshino cherry actually? A species? A natural hybrid? An artificially produced plant? The fruits, known as drupes, quickly ripen to a black color within just a few weeks. They are sour tasting however due to their high acidity. We know one thing – the Yoshino cherry was known to be cultivated in Edo (the name for Tokyo during the Edo Period) in an area known as Somei around the middle of the 1800s. Beyond that, things get quite a bit fuzzier. The Somei growers called them yoshinozakura (meaning Yoshino cherry), after a famous cherry covered mountain in Nara Prefecture. This designation was in honor of the mountain only, not implying the origin of the Yoshino cherry. During the 1880s Dr. K. Fujino undertook a study of the cherry trees planted at Tokyo’s famous Ueno Park. He determined that the park contained three distinct species, one of which he called somei-yoshino – a name that has stuck to this very day in Japan. He published his report in 1900 and the following year Dr. J. Matsumura gave the tree its Latin name, Prunus yedoenis. Despite these facts nothing definitive about this tree’s origin was yet known. 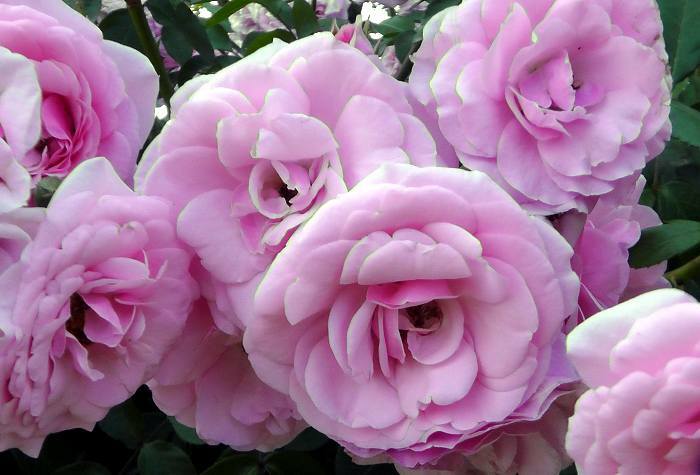 This article is part II of the types of roses that can be seen at Kayoichou Park, near the City of Fukuoka on the island of Kyushu, Japan. Check here for part I to see a general description of the garden, and of course more rose varieties. Those wishing to visit the garden can access it by taking the JR train from Hakata Station in Fukuoka City. Get on the Fukuhoku Yutata Line bound for Sasaguri or Nogata and get off at Choujabaru Station (the fourth stop if you’re on the local train, or the second if your on the fast train). During midday around three trains travel per hour and leave from platform 8. The current fare is 230 yen one way from Hakata. The park is a 10-12 minute walk from Choujabaru station. The best flower viewing is in mid-May. 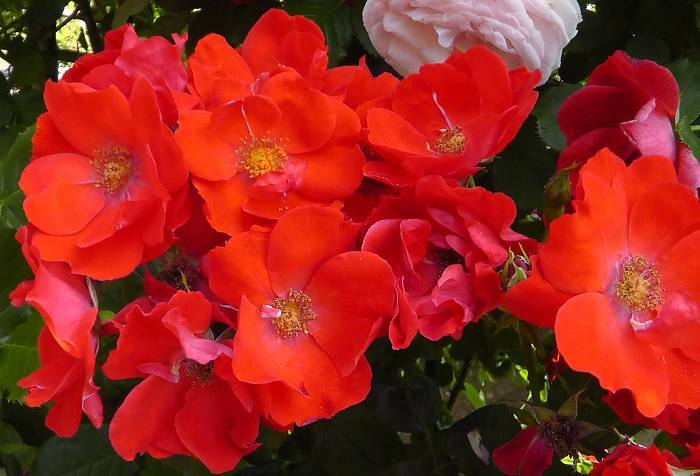 Comments: Wonderful bushy rose with clusters of orange-yellow flowers with yellow stamens, fading to red. Hardy to USDA zone 5. Also known as R. ‘Cheerio’. Kayoichou Park is situated in Kasuya Town on the edge of Fukuoka City on the island of Kyushu, Japan, and is host to a wide variety of sports facilities, public green spaces, and gardens. The park is arranged around a large central reservoir with a number of peninsulas, coves, and even a small island, all accessible by large, paved pathways. The park is famous for its cherry blossoms in spring, and on the lake’s largest promontory there sits a 1,300 square meter (~14,000 sq. ft.) rose garden boasting 180 rose varieties, comprising 2,600 individual plants. Founded in 2001, it has quickly become a favorite local flower viewing spot. 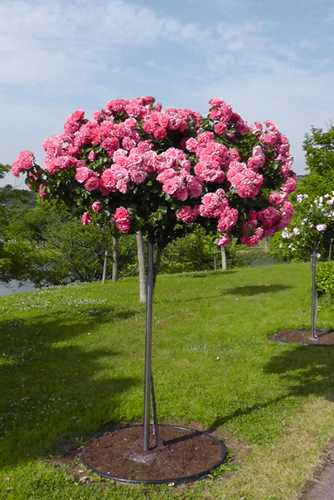 There are a number of beautifully kept standard (tree style) roses at Kayoichou Park. The plants are in peak flower from early to mid May, with a second, less spectacular flowering period occurring in October. Summers in Fukuoka are too hot and wet to allow good flowering for roses, and winters are too cold. The garden is situated in a zone 9 climate, but overall experiences annual temperatures comparable to Atlanta, Georgia or Charleston, South Carolina. The garden features several rose tunnels, a number of smaller rose gardens scattered around the lake, many standard (tree) roses up to 2 meters tall, as well as the main garden itself consisting of tiered beds of plants easily accessed by paved trails throughout. 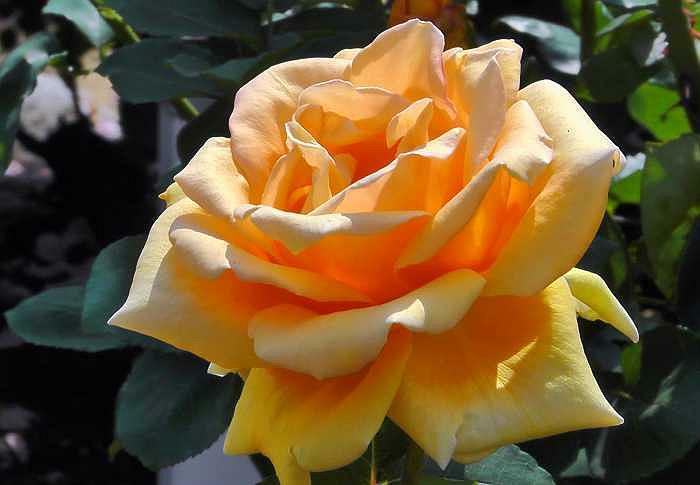 Roses in the garden are of many types including hybrid tea, floribunda, grandiflora, miniature, polyantha, and large flowered climbing varieties. 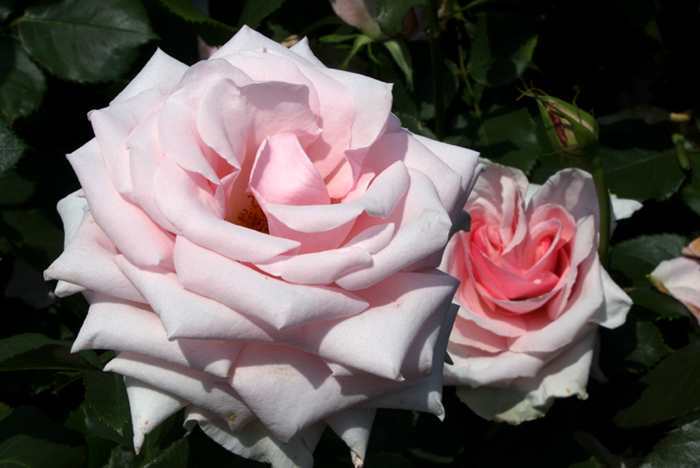 All in all the hybrid tea and floribunda types seem to steal the show. 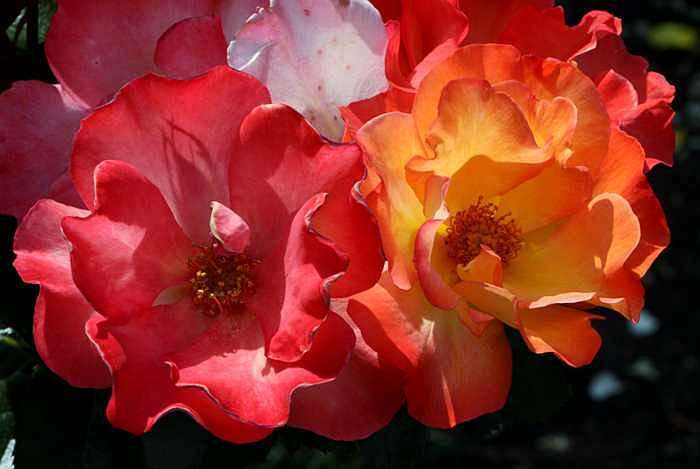 This article is the first part showcasing some of the roses you can see at this modest sized, yet comprehensive garden. Comments: Lovely, large flowered, upright growing shrub. Hardy to USDA zone 6 and colder with winter protection. Every spring throughout Japan the most beloved flower of this island nation shows its beauty, and is celebrated with ohanami, literally meaning “blossom viewing”. The flowers in question are of course the world famous flowering cherry trees, known as sakura in Japan. The star of the show is somei-yoshino, known in the west as the Yoshino cherry, Prunus x yedoensis. People gather anywhere they can find a flowering tree large enough to hold an impromptu party under its flowering boughs. They eat, drink, and take in the fine weather of early spring under their favorite national symbol. The taxonomy of the genus Prunus is problematic at best, containing no less than six subgenera, comprising a wide range of trees. Many are grown for their fruits (plums, apricots, peaches, and of course cherries), and one species, P. dulcis, is famous for its nut, the almond. Some authorities persist in separating these groups into different genera, creating yet more confusion. Most Prunus that are enjoyed for their flowers are in the subgenus Cerasus, the cherries. The complexity of naming them all is compounded by the extreme variation in flower forms that have been developed over the years. Ironically, most of the cherries enjoyed for their flowers are derived from a relatively few species: Prunus campanulata, P. incisa, P. jamasakura, P. serrulata, P. sargentii, P. spachiana (syn. subhirtella), and P. speciosa (syn. lannesiana). The amazing number of flower forms they can assume however, is astounding – some the result of wild hybridization, and others selected and bred by people, many with their origins lost to time. Every spring Japanese people of all ages eagerly await the flowering of Yoshino cherry trees in parks throughout Japan. 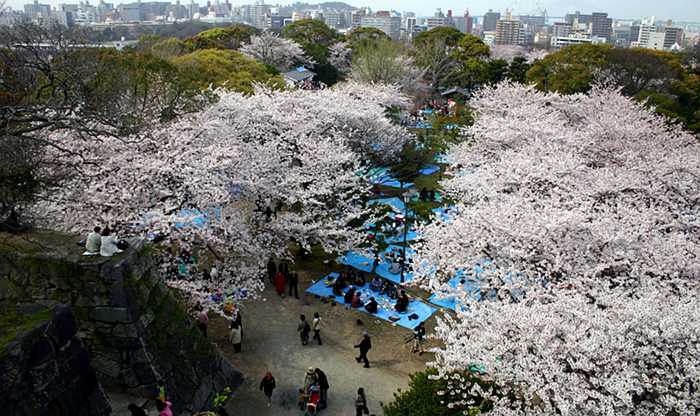 Ohanami nowadays is simply having a party under the flowering trees, always accompanied by food, and most folks drinking alcoholic beverages – beer, sake, and shouchu, a clear distilled liquor. The celebration pictured above is in Maizuru Koen, Fukuoka City, Kyushu, Japan. The most commonly planted flowering cherry tree in Japan these days is Prunus x yedoensis, a presumed natural hybrid resulting from the crossing of P. speciosa and P. spachiana f. ascendens. Trees are commonly planted along rivers, streets, and in parks, but only rarely in private yards. Here is a lovely row on the Ino River in Hisayama Town, Fukuoka Prefecture, Kyushu, Japan. Japan’s most famous fall flower surly is kiku, known in the west as the “common garden chrysanthemum” or more simply mum. As with virtually anything Japanese, kiku are neither truly Japanese in origin, nor simple to talk about. It is said that they were first brought to Japan from China as a medicine, coupled with a tale about them bringing long life (we’re talking 100s of years). Over the centuries kiku became popular garden plants and their status grew, to the point that the kiku flower even became the crest of the Japanese royal family by the Kamakura Period. Through the intervening centuries this plant has been cultivated across the world with whole societies devoted to its care and appreciation. In this article I will focus on the plant mostly from a Japanese perspective, with special emphasis on the wonderful kiku festivals, called kiku matsuri, that pop-up around Japan every fall. These kudamono kiku (spider mum) are grown in the fukusukezukuri style – one flower on a tiny plant. First a bit about the plant. 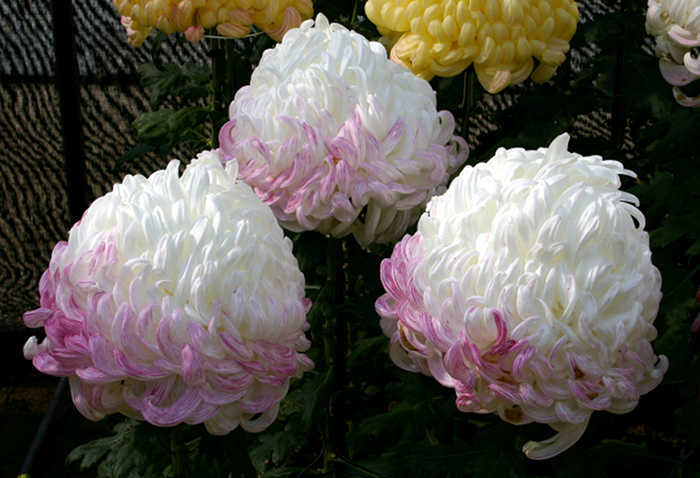 A name batted around a lot in the literature is Chrysanthemum x morifolium. According to Kew this is an unresolved name (though oddly they accept C. morifolium as valid) and synonymous with Dendranthema x grandiflora. Regardless, this name is the one most often applied to “common garden mums” as well as kiku. Looking at the flowers any fool can see something is up however, given the extreme variation in their form and size. Regardless of taxonomic difficulties, it is well known that hundreds of mum varieties exist, spanning an incredible range of flower and growth forms. In the west no less than 13 classes of flowers are recognized, and within Japan at least 7 basic types exist (with numerous sub-classes). More broadly, the genus contains somewhere around 40 accepted species, all Eurasian in origin, with their center of distribution in China. Interestingly, though the plant has been bred in the far east for centuries, it is well known that they are strongly self-incompatible (common within the Aster family), meaning you cannot self pollinate a plant to produce viable seeds. Nevertheless, most of the range of flower types known today were developed using traditional techniques (e.g. selective breeding). Also interesting is that despite the fact that C. x morifolium cultivars are polyploids (hexaploid, 2N=54) the precise origin of this type remains unknown. The large flowered types are called ougiku (large kiku), and are grown and displayed as single flowers. The most common Japanese classes are atsumono, kudamono, and ichimonji. Other flower types include chuukiku, kogiku, pottomamu, and kotenkiku based on flower size, breeding and form, and historical context. These flower types should not be confused however with the training styles mentioned below: fukusukezukuri, sanbonjitate, darumazukuri, senrinzaki, kengaizukuri, bonsaizukuri, and kikuningyo. The most massive type of flowers are known in Japan as atsumono (literally meaning ‘thick object”), also known as the “irregular incurve” class in the west. These are the giants of kiku flowers, with each up to 20 cm across. To achieve this flower size, only one flower can be allowed to form per stem through a process called “dis-budding” (the removal of all buds except the terminal one). Furthermore, there are different styles of how the plants are trained to grow. In one case just a single stem is allowed to develop with just one terminal, giant blossom on a very small plant (fukusukezukuri). Another taller form has three flowers growing on three stems per plant (sanbonjitate), each balancing the others according to old Chinese belief. Each flower represents one vital aspect – heaven (ten), earth (chi), and human (jin). A smaller stature version of sanbonjitate is called darumazukuri. The large flowered kiku type called atsumono are typically grown in groups of three. This training style is known as sanbonjitate with each flower representing balancing elements: heaven, earth, and human. During their development these flowers are painstakingly hand crafted, by manipulating the flower parts (florets) with thin sticks, thus bending and training them into the desired shape (often upward, creating a dense ball). In the west large flowered types like these have been given the unfortunate name of “football mum” – such a base name for a flower as regal as these! 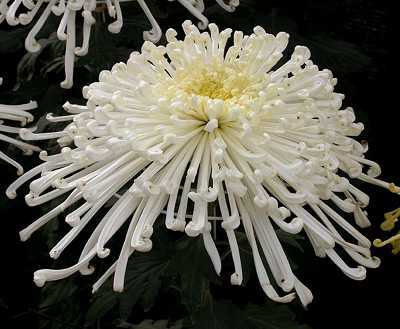 Another large flowered kiku is called kudamono, meaning “tube object”, and is better known in the west as a spider mum.